An Office is a branch of your business, you can have as many offices as branches of your business you have. 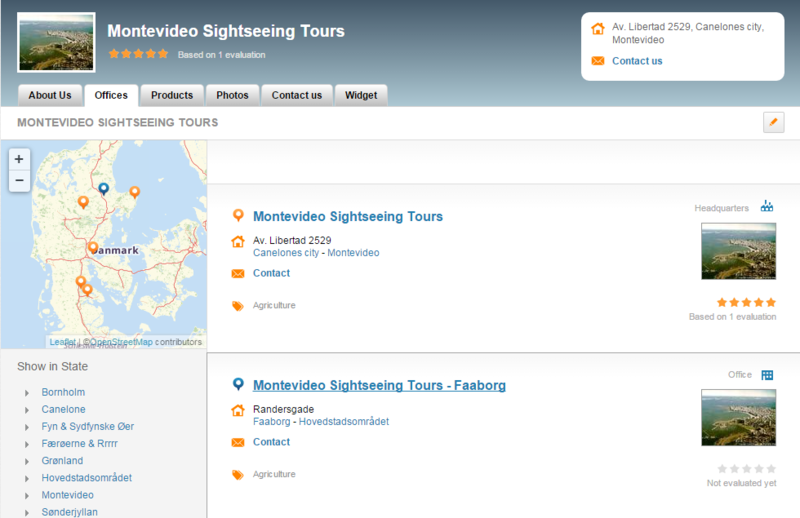 In the Offices Section you will be able to add a specific name, information, phone numbers, location, etc. 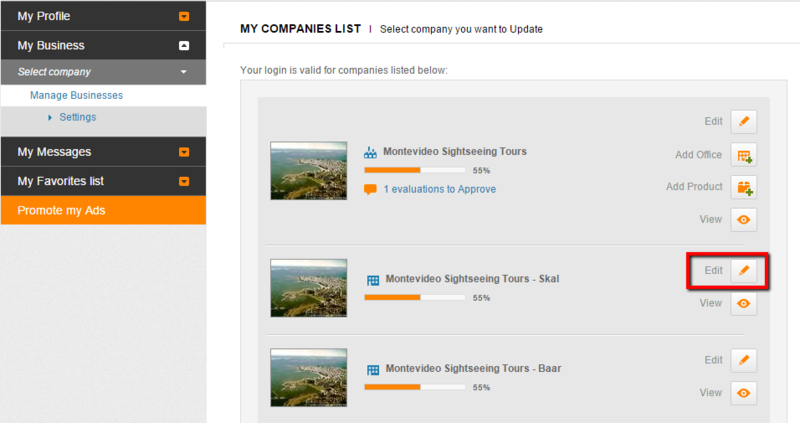 Each Company can be evaluated by other users. You can see the evaluations on the Company listing, and on Products listings, and their purpose is to give a place for the users and other companies to recommend your company, and to give their opinion. The Social Networks settings allow you to connect to the social networks of your company, in Twitter, and Linkedin, and share your activity on Tuugo within those networks. 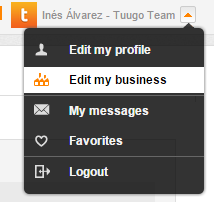 On Tuugo you can set your Privacy options, to control who can see your profile and contact you, or what do you want to show on your profile. In order to do that, mouseover on your Username, and select "Edit my profile" from the dropdown menu. You can't add more than 5 companies per e-mail, and more than 15 offices. If you are seeing your company published, but you want to update its information, you can do the following. ​You can create a new account by registering or by logging in through your own Facebook account. 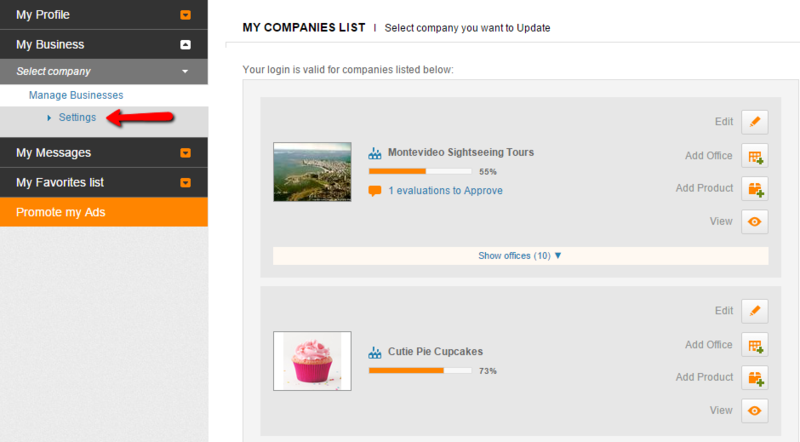 You can also login with your existing account, but in order to add Offices, you need a registered user first. Tuugo has released a Special Promotion, in which you can add some code into your website, and get Featured Ads on Tuugo as long as the code is there. 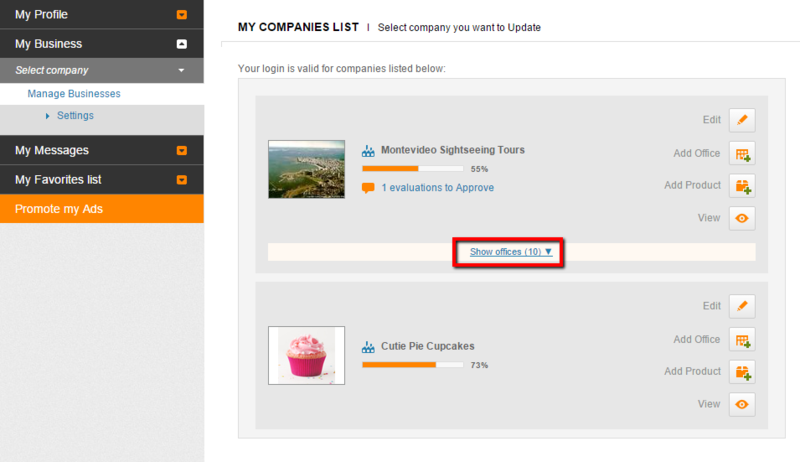 In order to add or edit details for your office, you can mouseover on your user name, and select "Edit my business"
Then, click on the "Show offices" link shown below. Once there, click on the "Edit" button for the office you want to edit. You can remove Offices from your Headquarters, but if you want to remove the Headquarter, you will have to remove all your Offices first. In order to remove an Office, select Edit my business by hovering on your Username, and selecting it from the dropdown menu. To update your information in case you already registered your company, please login into Tuugo with your username and your password or via social networks. Now move the mouse to the arrow in the upper right corner beside your name. Choose the "Edit my business" option. How do I get to the Control Panel of my business? 1) Login with your email and password or using a social networks account. Then mouseover on your username in the top right corner of any Tuugo page and select from the dropdown list "Edit my business" . If you want to delete your company, go to your Edit my business by doing mouseover on your username and selecting it from the dropdown menu. 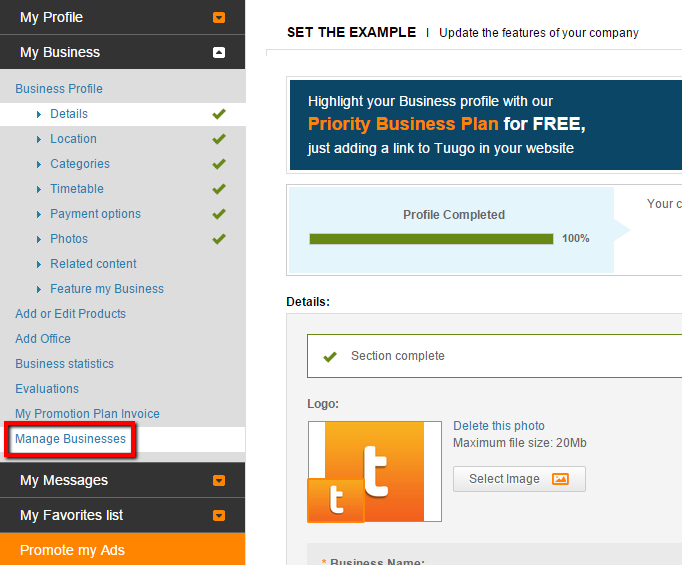 Then click on “Manage Businesses”. You will see the option “Settings”, so click there. If by any chance you have edited a company that wasn't your company, you can undo this.by hovering over your User name, then, on the Dropdown menu, select "Edit my business". If you want to add your Social Networks related to your Company on your Company Profile, you have to login with your username and password. 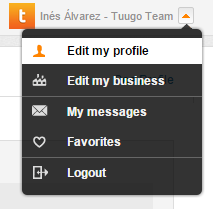 Once logged in, mouseover on your Username, and select "Edit my business" on the dropdown menu. In this case, you are asking about a Company Profile that already has an owner. In the middle part of the Company or Products profile pages you will find the section "Statistics:"
This section shows you how many visits your profile page had on certain time and how many clicks your page have had. The related content is content and information which is usually related to the listing you are watching. Free ads can also display content from their competitors, while Featured Ads don't. Often, it’s because the address is not well written, or has abbreviations on it, even it’s because has on it the apartment floor, or the building related to it. Why isn't my business shown in the Google/Bing searches? If you just created your company listing, or you just modified it, you have to understand that it takes at least 24 hours -it can take several weeks as well- before you can see your queries on Google/Bing search results.